Manufactured out of SS / Incoloy Tube. Suitable for dryers and washer dryers. Available in different wattages. Designed as per customers's specifications. We high quality ISI marked Customized Industrial Water Heaters as per customers specification. Furthermore, our quality controllers test these Coil Heaters heaters on various well-defined quality parameters before making these available to the clients. 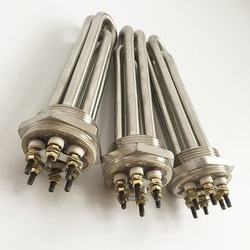 We offer Water Immersion Heating Elements, it basically serves general purpose and has the basic features of explosion and moisture resistance. It is available in high, medium and low watt densities for various processes. 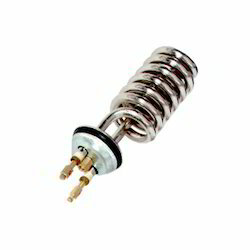 We have gained a remarkable position in the market that is involved in offering Vaporizer Heating Element. Being the leading names in industry we are offering a wide assortment of Water Heater Elements. These are made using optimum quality materials, which are procured from authentic vendors of the industry. We offer these to our customers in various watt densities as per their requirements. For Industrial hot water baths, water jacketed apparatus, side arm circulating process, tanks etc. fixed with metallic cap for protection of terminals. For Detail specification visit our website.